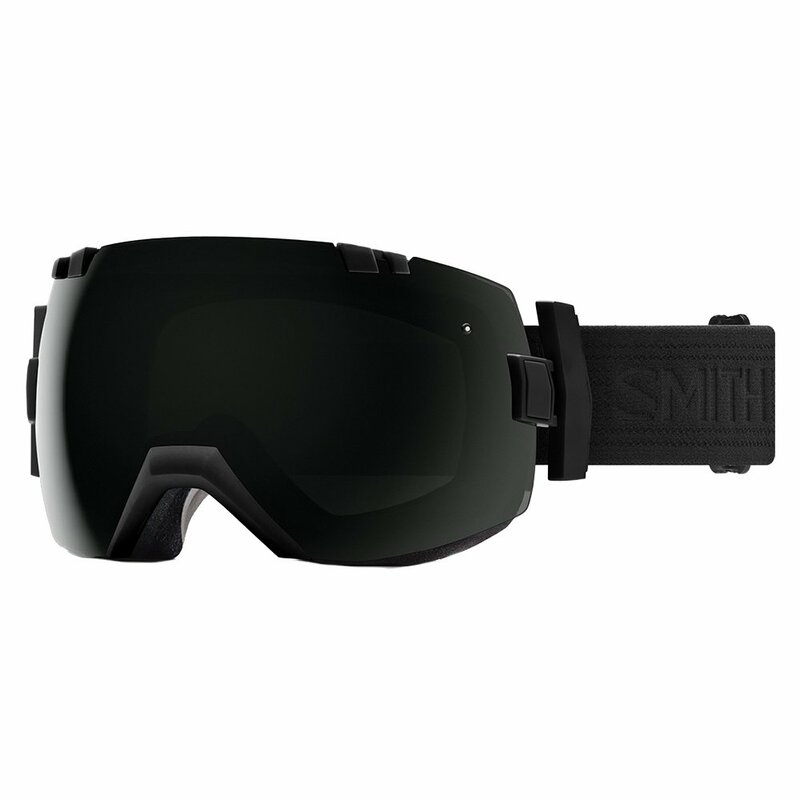 With scaled up coverage and top-shelf technology, the Smith I/OX Snow Goggle has pretty much everything anyone could want from eye protection. This Blackout colorway comes with a ChromaPop™ Sun Black lens, designed for maximum protection in the brightest environments. And the included ChromaPop™ Storm Rose Flash lens has you covered in low-light conditions as well. Both of them feature a 5X™ Anti-Fog treatment, and the ChromaPop™ technology built in filters the light for enhanced contrast and improved color perception in any light environment. Outstanding goggle. I have a large head and the IOX fits perfect. I ride in the great PNW and get all sorts of weather and these gogs hold up no problem. I have a few different lenses and they are super easy to switch out depending on the conditions. Incredible visibility. My one and only beef is that the goggle "buckle" scratches the inside of my goggle when I stash them carefully in my protective goggle sack. Super frustrating. Please figure out a buckle material or protect it so that does not scratch the inside of the lens. They're really nice and comfortable but some defects. I really love the way these googles look. They look very sick! I love how comfortable they feel. My problem is though that the lenses have fogged up on me in the most inopportune moment. They have fogged up on me when it was snowing and their was very low visibility already, after I fell in some powder I had to go through a massive tree run and my goggles were fogged up the whole time also when its cold or windy and I have to wear a balaclava they have fogged up. Another complaint I have, is the lense is not flushed with the frame, so it makes it to were air enters through those gaps. For the steep price, I would not recommend this to anyone who is a serious rider. I also wear a smith gage helmet that is suppose to help out with the flow of air from the goggles to help in preventing fog. Kinda disappointed. I love these goggles! I wear glasses and these goggles fit over them with ease. They are stylish as well as functional. If you don't wear glasses they look just as dope!! My opinion, owning two pair, BUY THEM! Bought these in Breckenridge on a recent trip and I love them. Wide field of vision, no fogging, works with my helmet and they even have a bit of foam removed by the nose cutout so it doesnt put pressure on my nose. Other goggles I have worn put pressure on my nose making it harder to breath, especially on those 10 degree snotty days on the mountain. Second day in Vail I had to swap lenses because it was cloudy and snowing and my first attempt took about 5 minutes in the car in the parking garage. Easy. Love these and hope they last forever. I bought these goggles with the intention of wearing them around my glasses (my glasses are pretty big) the smith I/0X fit amazingly. I love the OTG design and the overal look of them is awesome. Best goggles I've ever owned. These goggles fit and look great. Perfect fit between them and my Smith helmet. Large view and the lenses are easy to change. I have used Smith goggles for a long time. I bought the I/OX when it came out and been very please. It has wide view range, high ventilation, excellent clarity and room over my glasses. I have the black lens which even works in overcast conditions. My eyes are extremely sensitive to light. High quality. This product is great at keeping wind out of my eyes, I wear my glasses underneath. very slim fit with glasses but otherwise GREAT!! I love my I/OX's. Not only do they look sweet, but the lens quality is superb on all three of my lenses. The frame fits great, and offer a very wide field of vision. The only downside to these is the airflow. If I'm planning skiing at high speeds, like groomers as opposed to glades, I'll wear my other goggles. The I/OX just lets too much air, especially cold air in. I tear up to the point of having to stop and dab the tears off my eyes every run. First off love the googles! High quality & great vision is what sets the I OX apart from others on the market. Great they include two lens which are easily changed when the day goes from sun to night lighting. If I had to one negative feature it would be the air flow is maybe a little to much. At higher speeds (nothing crazy) the air flow comes through the google that on a colder day/night it will chill your face. I know this will reduce or basically eliminate any sort of fog but it can get close to making you tear from the air flow. I had no fog or any kind of condensation nor did I actually tear from the air flow but I do wish there was some kind of regulator to close off some of the air flow on the colder days/nights. iv only had these goggles for about 1 month and they are the best goggles i have ever had.they are awesome goggles for their price.there is only one thing i would change and that is that sometimes wind can get inside of the goggles but if mess around with them for a bit it will go away.anyway they changed the way i look at skiing...literally. Ever since I started sporting these "acid block" goggles things have changed. I can see in HD when schussbooming all over the powder covered mountain. I look like a cosmonaut on skis. Being able to see where I want to lay my shred line and shreding the line is simply a joy, in all conditions. Everything just pops! I wear my glasses under these goggles. The goggles have never fogged. Ive had them since the begining of this ski season and I ski a lot. My glasses do fog under normal circumstances such as my body being totally overheated while standing still. Or just being drenced after a long day in a heavy storm. The majority of the time it is perfect sight. I usually wear contacts while wearing my older ski goggles but i feel comfortable wearing my spectacles in the IOXs. The two lenses are awesome. I love the clear ones for flat light. Most pleased with these. And they are made right here in America, one state over from me. Thanks! I bought these goggles after hearing some good reviews from others. They do a fairly good job, and are a significantly better value for the price than other similar goggles. I do have two issues with this goggle though: first, they can fog up occasionally; in order to prevent this, you have to wait until you are outside to put them on to avoid trapping warm air. Also, lenses can be a bit of a pain to change. But otherwise these are great goggles, especially for the price. I am honestly quite mad with smith right now. While I love these goggles and they function great, these goggles scratch insanely easily. I am ana1-retantive about my goggles and I keep them in only the case as soon as I am done skiing. For some reason, as carefully as I handle these and follow instructions and clean them with only the case provided, they still find a way to scratch. I am especially frustrated because the low light lenses I have, mind you I have used these lenses once, now have a huge scratch that wasn't there when I put them back in the case after i was done with them. I am confused because my brother who has had a pair of smith I/Os for over a year now has not had the same problem. Smith just has the small company quaility check feeling in a company,. there products are solid and so are the people that work there. thanks for being a great company. Ive had these for years and NEVER a problem. Exeptional fit with the Smith Helmet. Also, I really like scratch resistant lenses. Plus easy to keep clean by just brushing the gove #cloth part# across lenses to clean them on the fly.